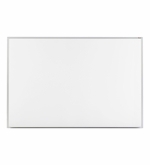 OptiMA Dry erase boards for the classroom. All great teachers know that using the right classroom tools can make a lesson plan that much more fun and engaging while promoting better active participation from the students. 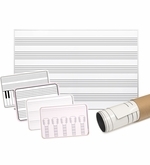 Dry erase boards are one of these tools but we've taken it a step further by designing a full line of printed dry erase boards specifically for the classroom. 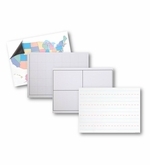 Better still, you can design custom printed dry erase boards tailored to your classroom or specific lesson plans. 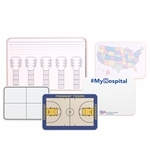 Of course we have many of the most commonly requested boards as stock items; USA maps, XY axis grids, music staff boards and more but remember that you can modify these designs to better fit what you need. 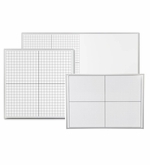 Want more columns in the grid board? Easy. 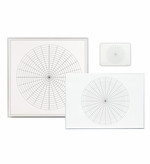 Want different markings on your XY axis board? No problem. Maybe you want something you don't see here at all, like a calendar that shows due dates for assignments, or handheld whiteboards with your name on them, this is our specialty and we look forward to working with you. We print boards large and small in house using our very own Opti-Print™ Dry Erase surface which features high resolution full-color graphics and our premier ghost-free writing surface. 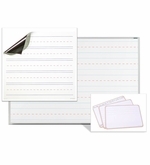 Best of all, these boards come with a full five year warranty for erasability so you won't be replacing these boards next year like you may have with many of the low quality options out there. Our graphics are sealed under the dry erase surface so they won't scratch or chip off. Also your color choices aren't limited these are full color and high resolution so your new boards are going to look and work beautiful.